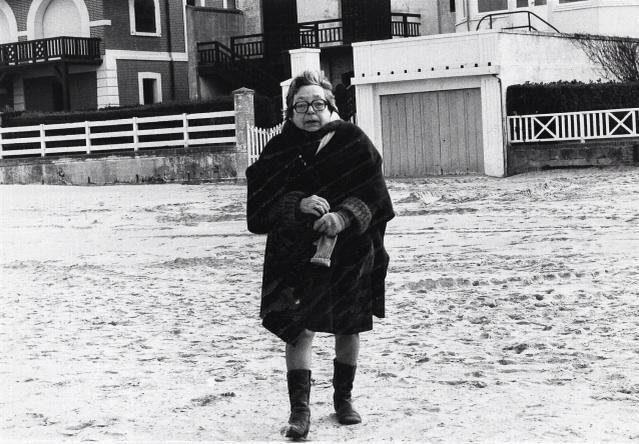 Marguerite Duras lived in the Hôtel des Roches Noires in Trouville on the Normandy coast for over thirty years, spending long periods of time there from 1963 to 1996. She would stare out of the window towards the horizon line or at least was photographed often staring out of the window towards the horizon line. Though undoubtedly here at all different seasons, the Trouville coast seen through Duras’ eyes – in novels and in films – is wintery. Trouville is a winter place for Duras, living the latter part of her life, before the seasons ultimately ceased their cycle, on the first floor in Apartment 105. Looking out onto this coastline is loaded with potential meaning and is an image that continues to echo on. Gustave Flaubert fell in love whilst staying in the same hotel when he was still a teenager; Claude Monet painted the hotel in 1870; and Marcel Proust stayed there regularly, including trips with his own mother a few doors down from Duras in Apartment 110. Balbec of Proust’s novel is itself a shadow version of the general area of Cabourg. The hotel is, therefore, cultural node on the coastline and Duras almost finalises it, drawing all of it together, sometimes unconsciously, sometimes overtly, and especially in her films. The space of the hotel and the winter seascape outside is a defining image of her later works, no longer dominated by the colonial images of a warm, stifling Gia-Dinh, the province where she grew up that would eventually become Saigon when Cochinchina became Vietnam. I believe this wintery atmosphere comes not just from being in the resort at that time of year but from seeing with an eye that’s looking back. Duras is refreshing when it comes to looking back as she is far from nostalgic; she’s a natural post-war progression from Proust’s pleasures of the past in some regards. She looks to the war and, most importantly, lost loves with both longing and awareness that the gap growing between will always become larger rather than smaller. Many lost loves in fact seem to manifest through this building and the beach outside. She may take pleasure in reminiscing, as she clearly does in her novel Yann Andréa Steiner (1992), but such an act cannot escape the reality that the love was in some way still lost, in the past tense. No warmth from the memory can remove the ultimate chill of the sorrowful present, the endlessly empty rooms of hotel in Trouville’s icy winters echoing with their lack of other voices. Yann Andréa Steiner is an interesting novel because of this use of the space with the love burgeoning between the much older Duras and the twenty-eight year old Steiner. There’s something knowing about Duras’ exploration of the affair, not least in how precarious it was. Steiner himself was more of a fan than a lover who evolved to be such after he met the writer when she introduced her film India Song at his university. The events were partly adapted later from Steiner’s perspective and his own diary into the film Cet Amour-là (2003) but there’s something lacking from the film, if only because it fails to capture Trouville’s (and Duras’) true oncoming winter. In her novel, Duras even touches on past frustrations embedded into the hotel and the coastline, touching specifically upon Proust and his overwhelming jealousy over questionable relations that his love Albertine may or may not have been having with another woman. She wrote (and this is an English translation) that: “…these slow evenings, you remember, when they were dancing in front of him, the two naughty young girls, he, tortured by the desire of them who were on the verge of losing their lives and who cried there, on the sofa in the large living room with sea view.” Fittingly, when Chantal Akerman adapted Proust’s The Captive (La Captive) in 2000, the film ends on the coast in a hotel at winter, with the characters both ending up in the water, one disappearing under the waves. Duras herself would document the actual hotel most effectively in her film work, filming features and shorts back-to-back there and then reconfiguring their themes with varying voiceovers. This is most apparent in a pair of films, the feature film, Agatha And The Limitless Readings (Agatha et les lectures illimitées, 1981), and the short, The Atlantic Man (L’homme Atlantique, 1981). Both have slow, roving eyes that follow wordless characters, communicating like ghosts through voiceovers. The performers may just as well not be in the same room, such is the cold distance between them. Lovers recount times when they were closer, wandering past each other as if now deceased and floating through to some wintery beyond.